. In 2014, Android evolved and opened up to new screens for your wrist, car and living room. We also introduced Android TV with Nexus Player last Fall and at this week’s Consumer Electronics Show in Las Vegas, our partners are showcasing what’s in store for television in 2015. This spring, Sony, Sharp and TP Vision, with its range of Philips TVs, will start shipping televisions powered by Android TV. These have all the goodness of Android TV built in so you won’t need to plug anything extra into your television. You can use a single remote to watch live TV channels and play games, movies or shows from Google Play and your apps. These televisions feature voice search, to help you quickly find what you want, and they’re Google Cast Ready so you can cast your favorite entertainment from your phone or tablet to the big screen. Android TV will come to life on screens big and small, including brilliant 4K displays, thanks to the work of our partners. If you want to get in on the action using your current television, Razer just announced a gaming console powered by Android TV. Razer’s Forge TV has high-performance specs, a wireless game controller and allows you to stream PC games to your TV. It will start shipping to consumers in February. Huawei is also working on an Android TV streaming media player that will be ready later this year. When we launched Android with a single phone in 2008, we never imagined that we could connect over a billion people. And now, we're working closely with an entire ecosystem of TV partners -- hardware manufacturers, service providers, and chip makers -- to reimagine the living room. All major television and TV device chip makers are participating: ARM, Broadcom, Imagination Technologies, Intel, Marvell, MediaTek, MStar, Nvidia, Qualcomm, and STMicroelectronics. 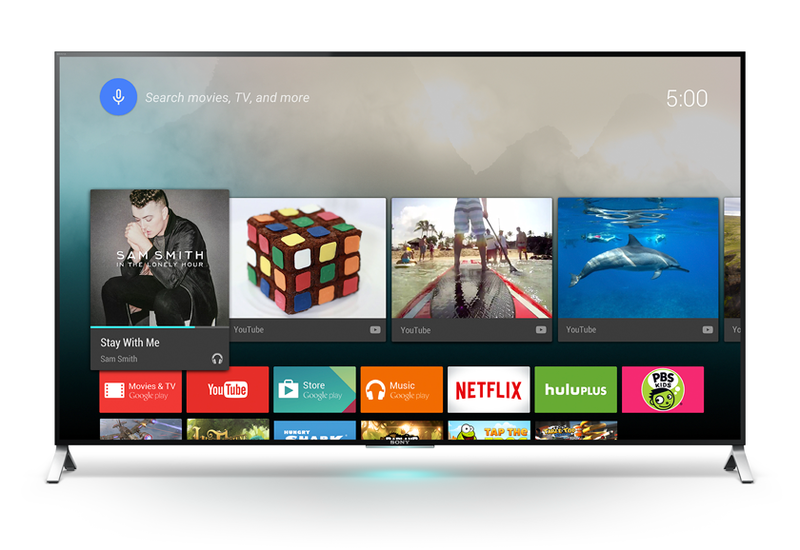 As we start off 2015 at CES, I’m excited for what’s in store this year for Android TV. Android started with a simple thought: when everybody participates, good things happen. In 2014, Android evolved and opened up to new screens for your wrist, car and living room. We also introduced Android TV with Nexus Player last Fall and at this week’s Consumer Electronics Show in Las Vegas, our partners are showcasing what’s in store for television in 2015. I cannot wait to try Android TV, this is the reason I'm holding off on a new purchase. If you could announce when it will be available in which regions that would really be great. I don't mind a wait (too much) but I'd like to know how long we're looking at before the UK receives some Android TV love. Sony Bravia with Android TV? This is amazing. I'm hoping a TV (or box) comes out with the Tegra X1 sometime soon. That thing is a monster - almost as powerful as the Xbox One. Are you kidding me!? Will LG Google TV 55GA7900 be upgraded to Android TV? Good news and I am waiting for Android TV and I am crazy for it. Thanks for creating and sharing this great article. 2015 will be an exciting year for Android TV. I will cover porting an exiting app from mobile to TV in my upcoming ebook: Agile Android Software Development. I've been soundly burned in my previous ventures into Google TV. I think I'll sit on my heels a while before I jump into this one. I *DO* hope it lives up to the hype! whether the virus can attack android tv ? When will Google release Android lollipop update for Android One devices its been 3 months. Thanks for this post. Anyone looking for a Software Development Company please contact us.